Netvizio is a multi-awards winning start-up company founded in 2007, specialized in online content augmentation based on an App Store model. Netvizio is headquartered in Paris, France and has offices in Singapore. Our multi-cultural team is a powerful mix of very experienced managers and developers with remarkable track records, and young, dynamic newcomers from top engineering and business schools. Netvizio is dedicated to pushing the boundaries of online video augmentation on the three screens: PC, Connected TV and Handheld mobile devices. Netvizio revolutionizes all usages of online video by bringing new interactive features to enhance video content and to create new revenue channels. Netvizio constantly develops new technologies and features to provide the best solutions to media groups, broadcasters, telcos and advertising agencies. by the French government-sponsored OSEO innovation agency since 2008. 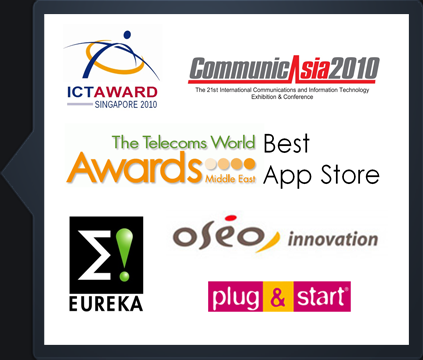 Telecoms World Award Middle East 2010 for the "Best App Store" category. We push the boundaries of online video augmentation. For you. Our team is a global, powerful mix of very experienced managers and developers with remarkable track records. It is composed of young, dynamic newcomers from top engineering and business schools around the world (Telecom SudParis, Telecom ParisTech, ESSEC Business School, EM Lyon, MIT University (MISTI), Imperial College of London, Melbourne Business School, Tel-Aviv University and University of Shanghai). Our multi cultural team brings complementary proven skills and in-depth expertise in the areas of 3G/HSxPA, IMS/NGN, cloud computing, SaaS deployments and platform design, high-definition real-time video communications, video transcoding and image processing, core telecom-Web 2.0 convergence, Neural networks and security, as well as outstanding executive management talents. Netvizio works extensively with Academic partners, University Labs and Institutes of Higher Learning worldwide. Netvizio is leading a media development research program with the MIT University (MISTI program) and the Afeka College of Engineering. As part of this program, MIT and Afeka students will intern at Netvizio and work on a variety of joint research projects on the world most advanced New User Interface techniques and in-video form/object tracking technologies. Netvizio hires and trains every year Engineering students in Telecommunications and Computer Science from the University of Shanghai, Université de Technologie de Compiègne (France) and Université de Technologie de Troyes (France). Since Netvizio's App Store is open, the worldwide community of app developers is our privileged partner to constantly enrich the App Store and provide video publishers with innovative ways to augment their content.